Help interpreters in the Central African Republic repair their ransacked homes before the rainy season. Former staff interpreters at the International Criminal Court now find themselves in a dire situation due to the fighting in the Central African Republic, but we can help by donating here. In March 2010 a group of Sango field interpreters joined the ICC to be trained as simultaneous court interpreters, the first Sango booth in the world. After qualifying as simultaneous Court interpreters at the ICC, they went on to interpret between Sango and French in the case The Prosecutor v. Jean-Pierre Bemba for crimes against humanity and war crimes committed in the Central African Republic. The trial started in November 2010 and continued until November 2013, when their contracts ran out and they had to leave the Court. As you will know, civil war has once again broken out in the Central African Republic. One interpreter has sought asylum in Paris, leaving behind his home in Bangui that was ransacked and his car stolen. Another made it to Cameroon with his family, but is running out of funds. Others remain trapped in Bangui. One had the entire contents of his house ransacked by a mob on Christmas day 2013, only to have what little was left (roof, doors) stolen or smashed by another mob on 23 January 2014: “Le sacrifice consenti pendant plus de dix ans pour construire cette maison s’est envolé en moins de deux heures”. On 20 February he was held up by a group at gunpoint and had his car stolen. He and his family are now internally displaced persons who cannot go back to their homes due to the security situation. Those out of the CAR are out of danger but have major financial difficulties. Those in the CAR are just glad to be alive at the moment. But all is not lost. We can make a real difference. 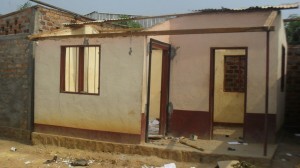 All the interpreters need funds, whether for essential repairs to a home before the rainy season renders it completely uninhabitable, or to pay for transportation out of the CAR to a safe location, or for basic subsistence until they can find or are allowed to work in the countries to which they have fled. Make a difference today! Thanks so much for your support! Click here to give to the appeal fund.